Perfect for families, budding photo enthusiasts and first-time SLR users alike, the EOS Rebel T5 makes it easy to capture movies and photos that are nothing short of dazzling. It features a powerful 18.0 Megapixel CMOS (APS-C) image sensor and Canon’s DIGIC 4 Image Processor for easy recording of HD video and high-resolution photos and has a huge 3.0-inch LCD screen for Live View recording and review. With a 63-zone, Dual-layer metering system, an expanded ISO range for outstanding operation in less-than-perfect light, shooting modes like Scene Intelligent Auto to take the guesswork out of complex shots plus creative options like Canon’s Basic+ function and Creative Auto, the EOS Rebel T5 is ready for anything. With a helpful Feature Guide, rugged, lightweight construction and proven Canon design, the EOS Rebel T5 makes EOS SLR photography faster and easier than ever! 18.0 Megapixel CMOS (APS-C) Sensor The EOS Rebel T5 has an 18.0 Megapixel CMOS (Complementary Metal Oxide Semiconductor) sensor that captures images with exceptional clarity and tonal range, and offers more than enough resolution for big enlargements or crops – your photos can be printed and framed without having to worry about quality. This first-class sensor is APS-C sized for an effective 1.6x field of view (compared to 35mm format) and features many of the same new technologies as used by professional Canon cameras to maximize each pixel’s light gathering, helping to ensure images are captured beautifully and brilliantly. DIGIC 4 Image Processor The DIGIC 4 Image Processor on the EOS Rebel T5 dramatically speeds up camera operations, offering an intuitive shooting experience and providing images full of detail and natural color reproduction. It works in concert with the camera’s 18.0 Megapixel CMOS sensor to achieve phenomenal levels of performance in virtually every situation, so you can shoot without having to worry about camera processes. EOS Full HD Movie The EOS Rebel T5 offers easy-to-use video capture with breathtaking Full HD quality that is difficult for a smartphone to match. Capable of shooting in a number of recording sizes and frame rates, the EOS Rebel T5 offers outstanding video capturing performance, quality and simplicity – simply press the dedicated Live View/Movie Recording button to get started shooting. Additionally, the EOS Rebel T5 enables easy manual control of exposure, focus and Live View features and even allows for in-camera editing. And with a wealth of over 60 interchangeable lenses available to choose from, your video has plenty of creative options. Plus, with the Video Snapshot feature, the EOS Rebel T5 will capture short video clips (of 2, 4 or 8 seconds) then combine them automatically into one video file as a snapshot or highlights “album”. With no editing needed after shooting, the compiled video is perfect for sharing online or displaying directly on an HDTV via the camera’s HDMI port. Scene Intelligent Auto mode The EOS Rebel T5 features Scene Intelligent Auto mode, which incorporates a number of Canon technologies to deliver the best possible exposure, simply. Joining Picture Style Auto, Automatic Lighting Optimizer, Automatic White Balance, Autofocus, and Automatic Exposure, Scene Intelligent Auto mode analyzes the image, accounting for faces, colors, brightness, moving objects, contrast, and whether the camera is handheld or on a tripod. It then chooses the exposure and enhancements that bring out the best in any scene or situation. Users without extensive photography knowledge or experience will not need to puzzle over settings; the Scene Intelligent Auto mode simplifies DSLR image capture so photographers can simply concentrate on composing images. 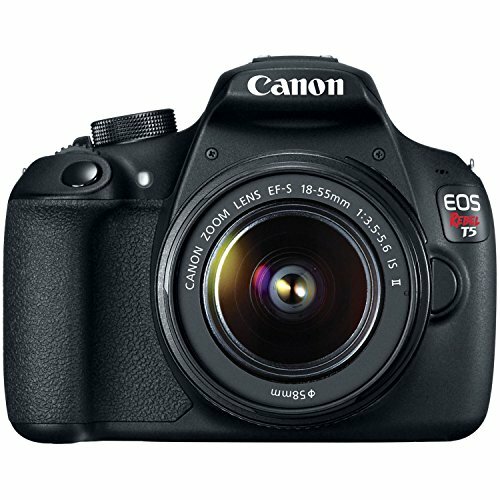 Up to 3.0 fps Continuous Shooting The EOS Rebel T5 is a fast camera, capturing up to 3.0 fps (frames per second) for up to approximately 69 JPEGs or approximately 6 RAW files. Whether capturing the action on the soccer field or waiting for that perfect expression, the EOS Rebel T5 delivers intuitive, speedy operation for the best shot. With instant startup, speedy AF and virtually no shutter lag, the EOS Rebel T5 will help you capture the action, every time. Feature Guide To help explain the specific function of features found on the EOS Rebel T5, the Feature Guide displays a simple description helpful in determining the applicability for the situation at hand. It is displayed in each shooting mode, during mode dial operations, and for Quick Control screen functions. It appears automatically when a function is selected – a lifesaver when trying to determine the best mode or function for the next picture. The feature guide works automatically by default, and can be disabled easily through the camera’s menu. Large 3.0-inch LCD Monitor The EOS Rebel T5 has a huge, bright 3.0-inch LCD monitor that is ideal for composing and capturing amazing images, as well as showing them off to friends and family. The large display has high resolution with 460,000 pixels and a wide viewing angle of 170°. It’s perfect for Live View composition or viewing camera settings like AF, ISO, Metering, AF Point selection and flash options. ISO 100–6400 (Expandable to H: 12800) With a broad range of light sensitivity ratings from ISO 100–6400 (expandable to H: 12800), the EOS Rebel T5 is ready to go no matter the light, capturing the finest detail with ease. Thanks to this expanded ISO range, the EOS Rebel T5 can capture more subjects in more situations, handheld, without the need for flash. This means more natural and detailed looking pictures and movies that can be shot discreetly, with ease. 9-point AF System and AI Servo AF The EOS Rebel T5 has exceptional autofocus with a 9-point AF system including a center cross-type AF point, delivering accurate focus whether the camera is oriented in portrait or landscape position. The system intelligently uses both normal and high-precision focus, depending on the aperture and available light, so your images are in crisp focus. An AI Servo AF system achieves and maintains consistent focus with an exceptional degree of reliability. Creative Filters The EOS Rebel T5 allows you to capture images with a new perspective without any need for extra accessories. The camera features five different creative filters for still images: Grainy B/W, Soft Focus, Fisheye Effect, Miniature Effect and Toy Camera Effect. Each filter alters the mood and feel of any particular scene, allowing you to create photos with a fun, distinctive flair. Basic+ and Creative Auto The EOS Rebel T5 is always ready to take beautiful pictures automatically. For photographers looking to experiment with more advanced settings, the EOS Rebel T5 is loaded with features to take you to the next level. Basic+ makes it easy to create the image effects you want, changing ambience or scene type according to simple choices made on the camera’s Quick Control Screen. And ideal for beginners looking to expand their photographic horizons is Creative Auto mode where basic settings are based on full automatic operation, but shooting guides on the LCD screen explain how to make changes to exposure, tone, sharpness and more, and how those changes will affect the final image. In essence, with Creative Auto mode, you can experiment and learn more about photography while still taking stunning photographs. Compatible with the full line of Canon EF and EF-S lenses The EOS Rebel T5 is compatible with all Canon lenses in the EF and EF-S lineup, ranging from ultra-wide angle to super telephoto lenses. Canon lenses employ advanced optical expertise and micron-precision engineering to deliver unprecedented performance in all facets of the photographic process. Numerous lenses feature Canon’s sophisticated Optical Image Stabilizer technology to minimize the effect of camera shake. Through Canon lenses, photographers can truly maximize the quality and liberating performance of the EOS Rebel T5. Compatible with GPS Receiver GP-E2 With the optional GPS Receiver GP-E2 attached to the hot shoe or the digital terminal, the EOS Rebel T5 can record location, including latitude, longitude and altitude, and has the ability to track the trajectory of movement with its logging function. An electric compass records the camera’s orientation during each shot, and world time information is recorded through GPS syncing. With GPS information, you can always remember where and when your images were taken, perfect for tagging vacation photos or organizing albums.